When it comes to cheap muscle, a second hand Agco Challenger tracked tractor can prove a cost effective option. Agco’s Challenger tractor range started to find its way onto UK farms from 2002, and over 1,200 of them have been sold since then. About 75 per cent of those are MT700 series, and the lion’s share of those models can be accounted for in the popular MT765 model. There were four models initially, including the 235hp MT735, of which very few made it into the UK; the 255hp MT745, the 290hp MT755 and 306hp MT765 quickly became Agco’s favoured line-up. Over the last 13 years, the range has evolved through B-series from 2005-2008, C-series from 2009-2012, D-series from 2012-2013 and latterly E-series with a shift in model numbering and a seventh cylinder under that huge nose. 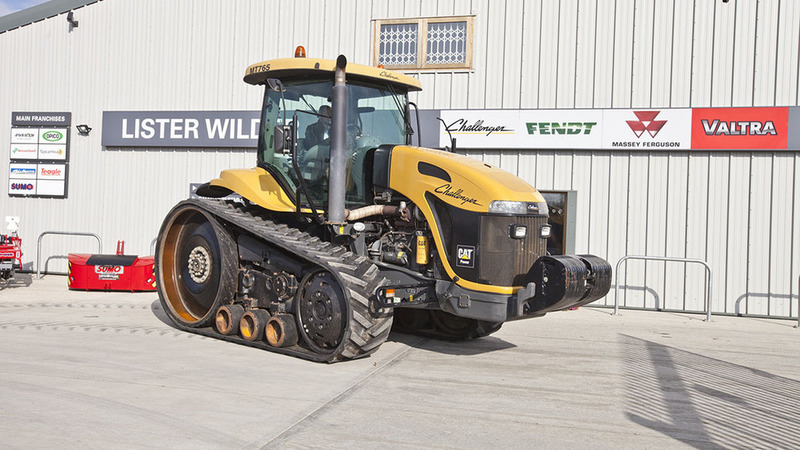 The UK does conceal a few imported tractors, shipped direct from the USA, and they are unlikely to have been homologated, as Lister Wilder sales manager and Challenger specialist Martin Turner explains. “Challengers imported direct from the USA won’t be equipped with secondary braking systems or emergency brakes,” warns Mr Turner. Dodging some of the less scrupulous imported machines means early Challenger MT700s now represent affordable frontline horsepower for smaller farms. Bought through the Challenger dealer network, there is good security for buyers too – currently, second owners have the option of continuing the warranty from five to eight years of age, and for up to 8,000 hours. “Warranty is extensive, though rubber and glass are obvious exclusions,” he says. 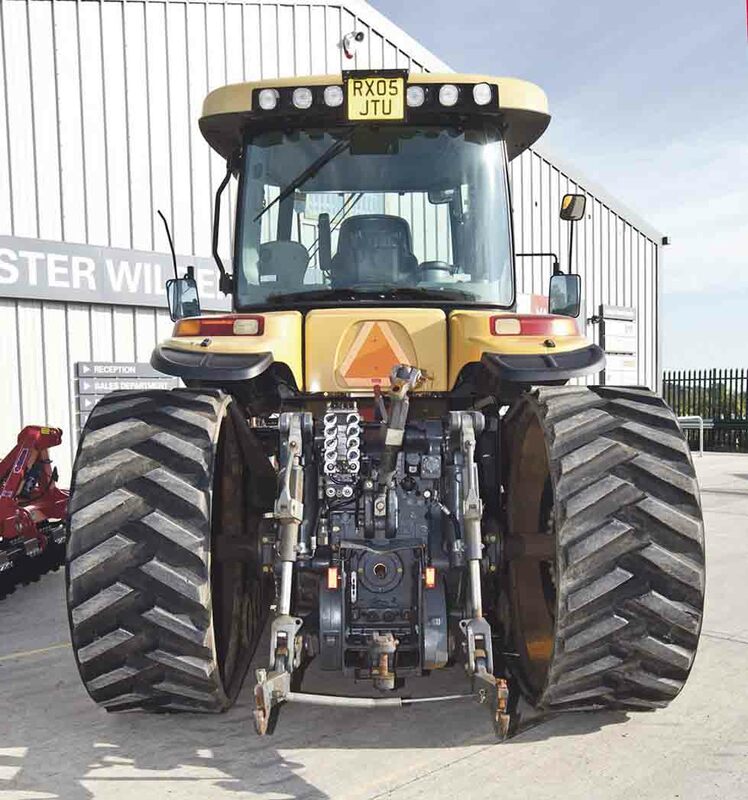 This 10-year old, 5,300-hour example of an early MT765, in Lister Wilder’s Southam depot is indicative of how a well-cared-for, low-houred, high-horsepower rubber-tracked beast can offer great value for the canny buyer. Its price is £46,950. MT700 A, B and C-series used Cat’s C9 engine, before Sisu power was shoe-horned in for Ds and Es. And this MT765 serves up 306hp from its inline six-cylinder, and is viewed as robust and reliable. However, look for evidence of service history – these tractors have a 250-hour service interval for good reason. Ignoring oil change intervals can lead to excessive coking in the oil, which can wreak havoc with the C9’s injector system and high pressure fuel pump. Any issues are likely to be picked up with a cold-start. While the engine will crank over to build fuel pressure, it should fire after a few revolutions and run cleanly. If it does not start promptly, you could be facing a £6,000 bill for a fuel pump and injectors. Tappets need to checked and adjusted every 2,000-hours too. Once running, the engine will load itself a few times while idling as it self-checks clutch pack settings and prepares itself for the off. The same 16 by four powershift transmission is found through A-E series, though later models benefit from revised software for smoother shifts and improved modulation. One area to check though is the parking brake. 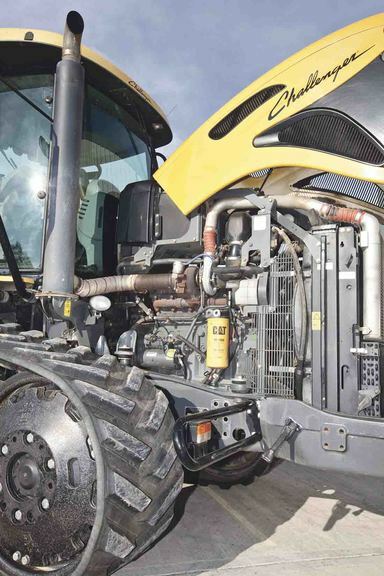 Tractors that may have had their parking brake applied before the tractor comes to a stop, could reveal a weak or non-existent parking brake function. To check, place the tractor on a gradient and apply the parking brake. If it rolls, you could be facing a £12,000 bill for a rebuild, as it needs a major strip-down to put right. MT700s are much less of a self-propelled drawbar than their larger stablemates, and as such, get category III/IV rear linkage, pto and a bank of spool valves. Four spools are standard, while six is the maximum. Grab the link arms and check for excessive free-play on the cross-shaft – the tractor uses nylon bearings. Drawbars wear, as do pins – later models get a wear plate to take some of the hit. Rear-end oil level needs to be checked through the sight glass, but with the engine running. Inspect tracks, mid-wheels, front idler and rear drive wheel. Typical track life is 3,000-5,000 hours depending on working conditions. Pay attention to the inside of the tracks, as this is where signs of failure are first likely to appear. 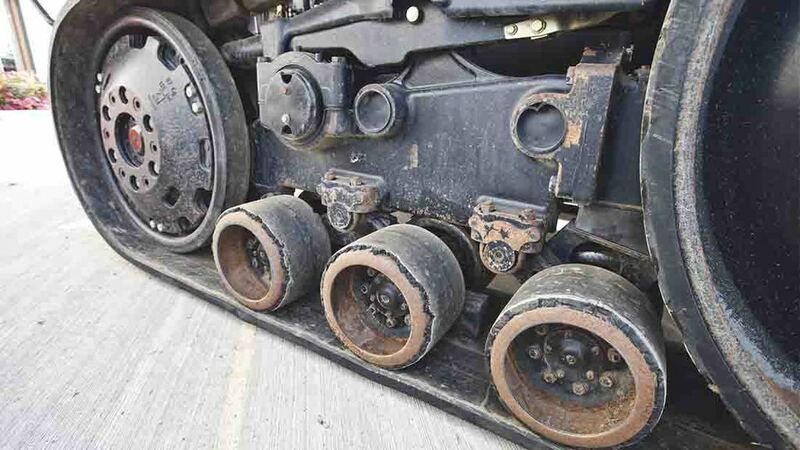 Check for track misalignment, which will show up as excessive wear on one side of the guide blocks. Mid-wheel axles can become bent, and any oil on the inside of the tracks also points to leaking seals on either the mid-wheels or front idler. A pair of 762mm- (30 inch-) wide Extreme Ag belts are still likely to cost almost as much as four tyres for a 300hp tractor, but looked after, they are said to last almost twice as long. The cab is a simple, straight-forward place to spend a working day. Beware models with optional sun-blinds fitted in the doorway though, its easy to be scalped going in. MT700 operators get an air suspended seat and air conditioning – the MT765 though, comes with climate control. 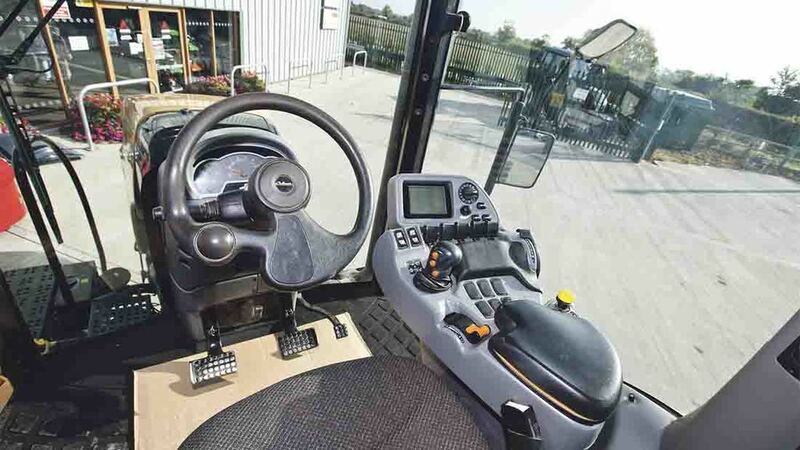 Little to worry about in the cab, as this era of MT delivers fuss-free operation and simple electronics. This model is missing its control box mounting bar from the right-hand side of the cab, and the armrest padding is showing signs of fatigue. Light grey interior trim is used in the A-series, but was soon replaced by darker coloured items in the B-series. The logic here was to make the cab interior appear less grubby. The cab interior changed completely with C-series - these later models also gained an IsoBus terminal too. Pre-2007 models are unlikely to have an IsoBus socket at the rear unless it had been specified as an extra cost option. From 2007, IsoBus became standard on the MT700s. As with all secondhand machinery, condition is everything and a thorough test of the tractor will confirm if everything works and sounds just as it should, before you part with the cash.